You will play fewer games. Simple. No brainer. Doubly so if there are two little cute people in need of feeding, swaddling, diaper-changing, burping and rocking—oh so much rocking, though not so much in your arms as to spoil them—to put them to sleep. Games you can play one-handed on your phone will suddenly be the greatest, at least in the early days. It was in the hospital, right as the babies went to sleep, that I discovered the iPhone game Clash Royale. I was too tired to read. Too tired to do anything for long. And I sure wasn’t going to bust out a dedicated portable gaming machine like a 3DS or a Vita. But a quick thumb-driven game I could enjoy on my phone for five minutes at a time? Perfect. 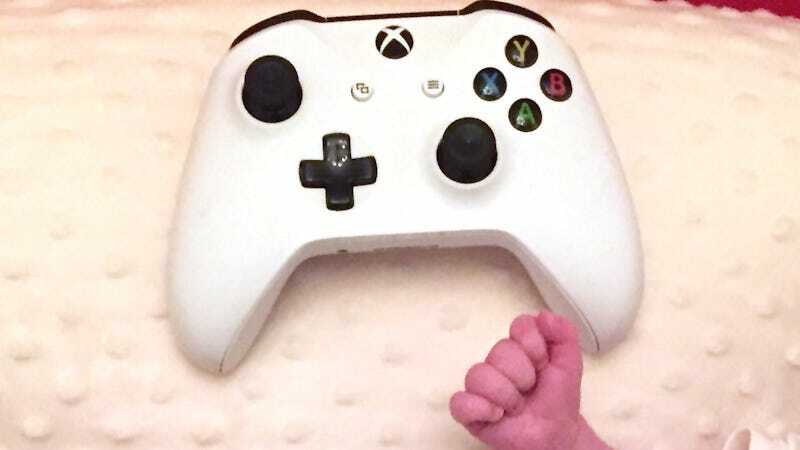 Multiplayer gaming isn’t compatible with having infants—unless you’re prepared to bail on a game mid-match while you… were… winning! You can’t finish the match, even if it’s just a three minute quick match in an aforementioned iPhone multiplayer game. You have to be rude and bail. You’ve got to take care of the babies, because they are your babies. Actually, you’ll sometimes have to bail as soon as matchmaking is complete, before the game has even started. You really just never know when the babies will need you. You will start assuming that the weird behavior of some gamers online might be because they are parents, too. When the people you matchmake with sometimes disappear, you will now consider that maybe they didn’t just ragequit or lose their internet signal. Maybe they they too are new dads or moms and have rushed off after hearing their baby wake up and start fussing. Or they just didn’t like losing. Handheld games will be your best connection to the world of gaming. Once you are home, turning on the TV to play games has the likelihood of upsetting the babies or your spouse and will likely require you to pause again and again to help tend to your kids. Those with one kid might be able to divide and conquer, but with two? That TV isn’t going to get much use. Better to finally figure out how to play Horizon Zero Dawn via remote play on a laptop right before going to bed. Better to get back to the 3DS and chip away at an old Kirby game you never finished. Better to…wow, what if there was a home console that could also be a portable? Wouldn’t that be neat? The creation of a home console that can be played anywhere, at any time without wires, without even needing to be paused, but that can be paused and unpaused in an eye-blink, will seem like the greatest thing to happen to console gaming since the second analog stick. And you will wonder, if the timing goes a certain way, did Nintendo somehow know that you were about to have twins and decide to release the Switch with a big new Zelda that you could take anywhere? Did they do this just for you? If so, thanks, Reggie. VR gaming is a no-go. You will look at any VR headsets you bought, consider the prospect of not being able to see or hear your infant children if they are suddenly distressed and decide, likely, that VR gaming is on ice for...a year? Two? Hopefully it’ll still be a thing when you can try it again. Long-session multiplayer is out, too. Two-hour Division Survival matches? A newfangled combo PvP/PvE Last Stand mode that sounds worth checking out even if just for a couple of hours? Yeah, right. No chance. It sure would be a shame if you were, say, a reporter who’d been covering Division all year and weren’t even able to cover the final expansion. Babies 2, Division 0. Bungie’s, uh, at least going to let me pause in Destiny 2, right? You will appreciate that they are too young to stick a 3DS cartridge into a PS4. You’ll miss some instant classics and pause some others for a long, long time. You will learn to face the facts that you will not play some big games very much or at all, that you messed up in never starting Metal Gear Solid V when you had a chance, that you will neither finish Gravity Rush Remastered or even make much of a dent in Gravity Rush 2, that you will enjoy Yakuza 6 via the Tweets of your colleagues and that you will likely resume Doom and Dishonored 2 from your last 2016 auto-save some time when the kids are older, though not when they are old enough to actively look at the screen and watch you ram a sword through someone’s skull. You won’t mind any of this all that much. You thought you might, but you don’t. They’re just too damn cute, both of them, and they don’t even know how to laugh yet.